The icon shown above is available on the left bottom corner of website. If you see this icon, it means we are available to resolve your query immediately via live messaging. The Live Chat is available from 8:00 AM to 8 PM. This icon shows that Chat option is in Offline mode. You can still submit your query in the form provided. The position of chat option will remain the same whether its online or offline. 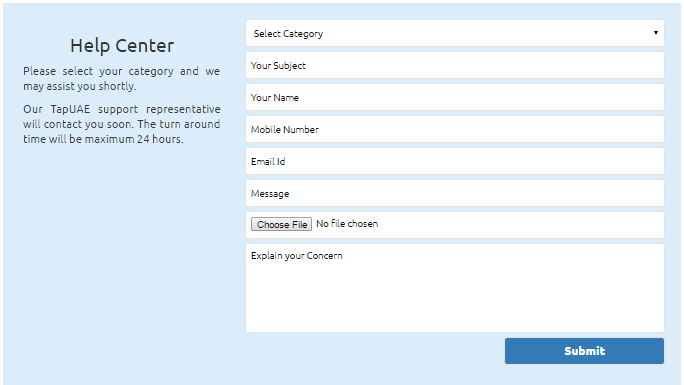 Its a one stop center to contact us, but we request you to select your correct category and we may assist you shortly. 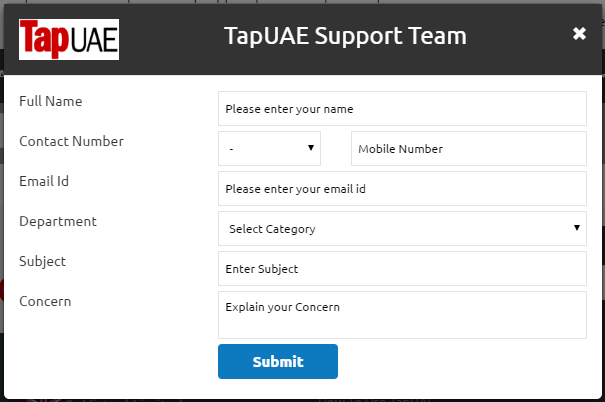 Our TapUAE support representative will contact you soon. The turn around time will be maximum 24 hours. We have static header, so no matter what position of page you are navigating, you can still see "Support" option on the top bar. Once you click one form opens up. Please fill all the mandatory field so that we can assist you correctly. We may contact you for further clarifications. You can see "Customer Service" above the weather widget. 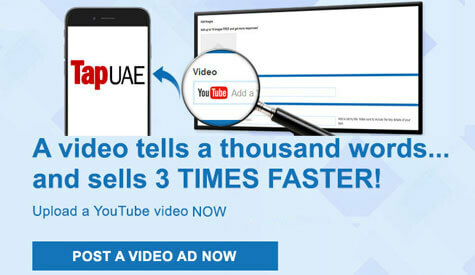 Once you click that link, you can see all the contact information of TapUAE. You can contact us via phone or email. We are always ready to help you.